In a small bowl, stir the pancake mix, water, apple and cinnamon just until moistened. Pour batter by 1/4 cupfuls onto a greased hot griddle; turn when bubbles form on top. Cook until second side is golden brown. Meanwhile, for syrup, in a small saucepan, combine the sugar, cornstarch, cinnamon and nutmeg. Stir in cider until smooth. Cook and stir over medium-high heat until thickened and bubbly, about 5 minutes. Reduce heat to low; cook and stir 2 minutes longer. Stir in butter and lemon juice. 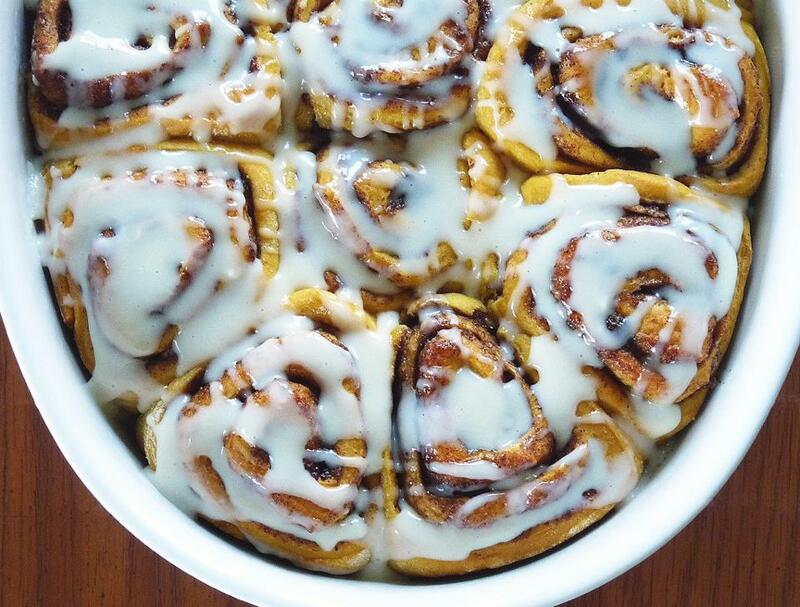 Serve with pancakes. 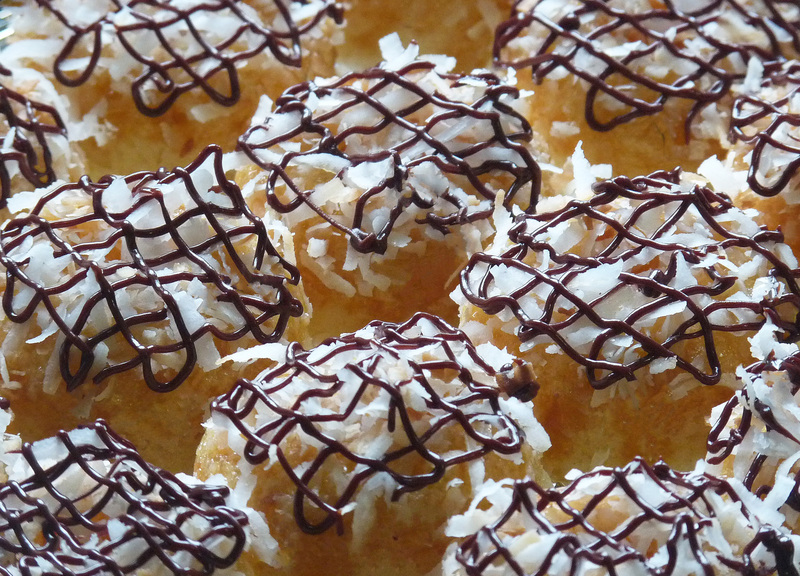 Happy Friday, baking gods and goddesses! I hit the Little Italy Farmer’s Market in San Diego for the first time two weeks ago, and was so overwhelmed by the incredible bounty of fresh fruits and vegetables, I didn’t even know where to look! Asparagus, strawberries, kale, citrus galore – I was in sensory overload and absolute culinary heaven. The first thing my eyes lit upon was the most vibrant, sunset-hued carton of ripe blood oranges, and I instantly snatched them up. I’ve been interested – but never dabbled seriously – in fruit preserving for years, and this seemed the perfect opportunity to give it a go. This recipe is slightly labor intensive – blood oranges are notoriously messy – but well worth the extra effort. While it would be ideal to slice the oranges with a mandolin, I didn’t have any issues thinly slicing them with a knife. 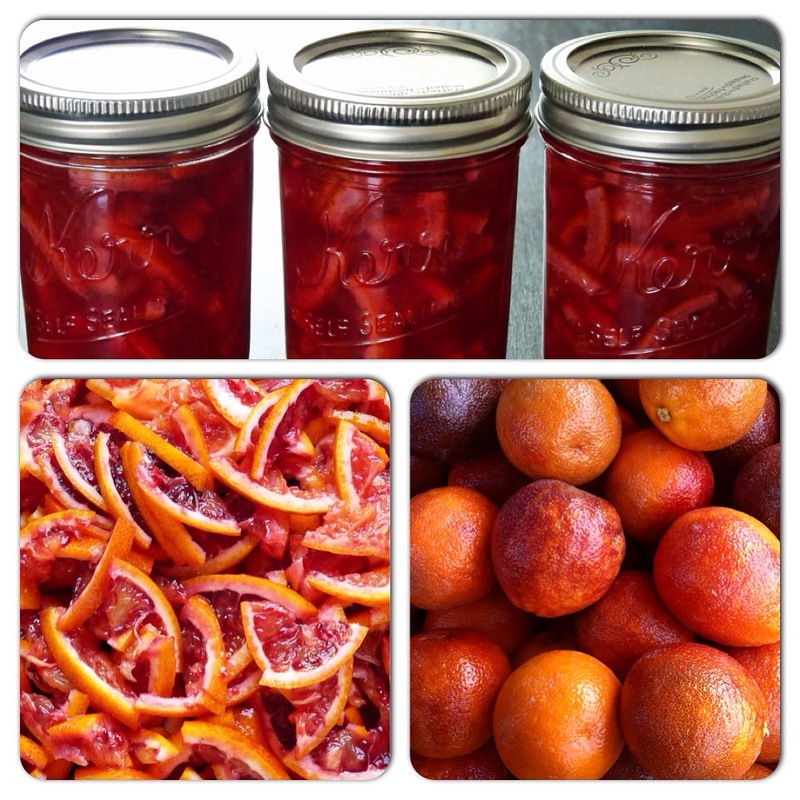 Make certain your marmalade reaches 220 degrees during the boiling process, and passes the plate/saucer/wrinkle test. Mine turned out a wee bit runny, but has been absolutely delicious on scones, and as a topping for vanilla ice cream. Enjoy! Wash blood oranges well, then dry. Trim away both ends and slice the oranges in half. Using a very sharp knife, trim away the core of the oranges and pluck out any seeds that you find. Set the cores and the seeds aside. Cut the orange halves into thin slices. Go as thin as you can manage (I recommend sharping your knife before starting this project). Finally, cut each sliced half in half again, so that you have a number of thin blood orange quarters. Bundle up the pithy cores and any seeds in a length of cheesecloth and tie it tightly so that nothing can escape. Put chopped oranges in a medium Pyrex bowl and cover with 3 cups water. Tuck the cheesecloth bundle into the bowl and cover with a length of plastic wrap. Refrigerate overnight (this process helps break down the pith). When you’re ready to cook your marmalade, remove the cheesecloth bundle. Combine the soaked fruit and water with 2 1/2 cups granulated sugar. Add fruit-sugar mixture to a deep, wide-mouth pan set over medium-high heat. Bring the marmalade to a simmer and cook until it is reduced by more than half, reads 220 degrees F on a thermometer and passes the plate/sauce/wrinkle test (see link above). When the mixture has finished cooking, pour marmalade into sterilized, half pint jars. Wipe rims, apply lids and rings and process in a boiling water bath canner for 10 minutes. Remove jars from water and place on a folded bath towel to cool to room temperature (lids will make a popping sound as they seal). 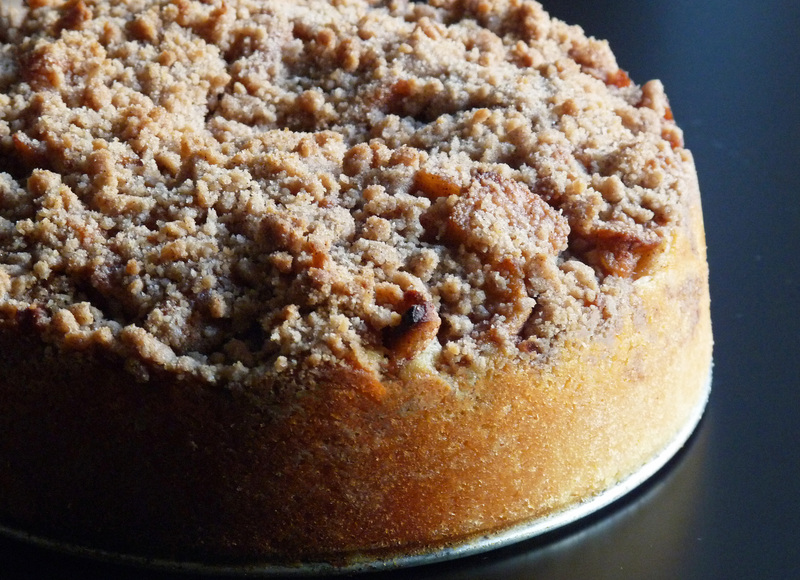 Happy November, baking gods and goddesses! Fair warning: this month is going to be all pumpkin, (almost) all the time. If you’re a pumpkin hater, it’s time for a hiatus from this blog (and some deep soul-searching, because seriously – you don’t know happiness). For the rest of you, welcome and enjoy! These Baked Pumpkin Doughnuts with Vanilla Glaze were a first for me. Not because I’ve never made doughnuts – in fact, I try a new doughnut recipe every fall – but because every single member of my household went absolutely BALLISTIC for them. My husband – who has never shown any particular interest in sweets – ate 5 before my last tray came out of the oven. Our puppy wouldn’t leave my side for a moment, and our two cats went on a meowing frenzy, ninja-flipping off walls and repeatedly jumping onto no-cat’s land (the kitchen counter). 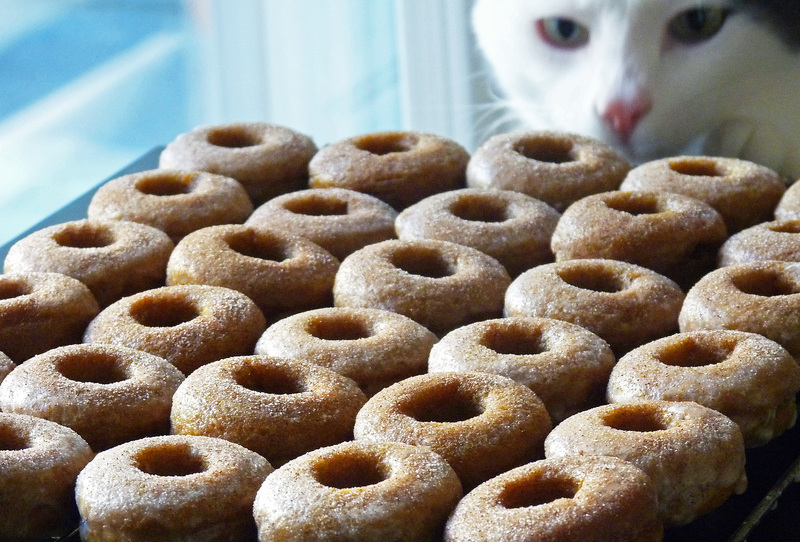 Just when I thought it was safe to reach for my camera and snap a few photos for this blog, our youngest kitty – a rescue boy named Perseus – poked his head up beside the cooling rack, snatched a doughnut, and was out of the room in a flash, leaving only a trail of crumbs in his wake. I don’t know exactly what it is about these wee doughnuts, but they’re definitely a fall favorite for creatures big and small! The original recipe (from the brilliant blog Confessions of a Cookbook Queen) calls for dipping the doughnuts in glaze only once, but I went for it (‘it’ being diabetes, I guess?) and dipped them three times. Then I sprinkled them with copious amounts of cinnamon-sugar. I know, I know – but I’m not sorry. Not even a little. They’re SO GOOD! Preheat oven to 425 degrees Fahrenheit (220 degrees Celsius). Spray mini doughnut molds with nonstick spray; set aside. Stirring frequently, bring pumpkin, cinnamon, and cloves to a simmer in a medium saucepan until puree thickens and just begins sticking to the bottom of the pan (approximately 4-6 minutes). Carefully pour the hot puree into a mixing bowl. Whisk in the brown sugar and oil, then slowly beat in the eggs. Add the flour mixture and whisk until just combined. Bake doughnuts in preheated oven for 5-6 minutes, or until the tops spring back when lightly touched. Keep an eye on these to prevent over-baking. Let the doughnuts cool in the pan for a few minutes, then turn out onto a cooling rack while you prepare glaze. 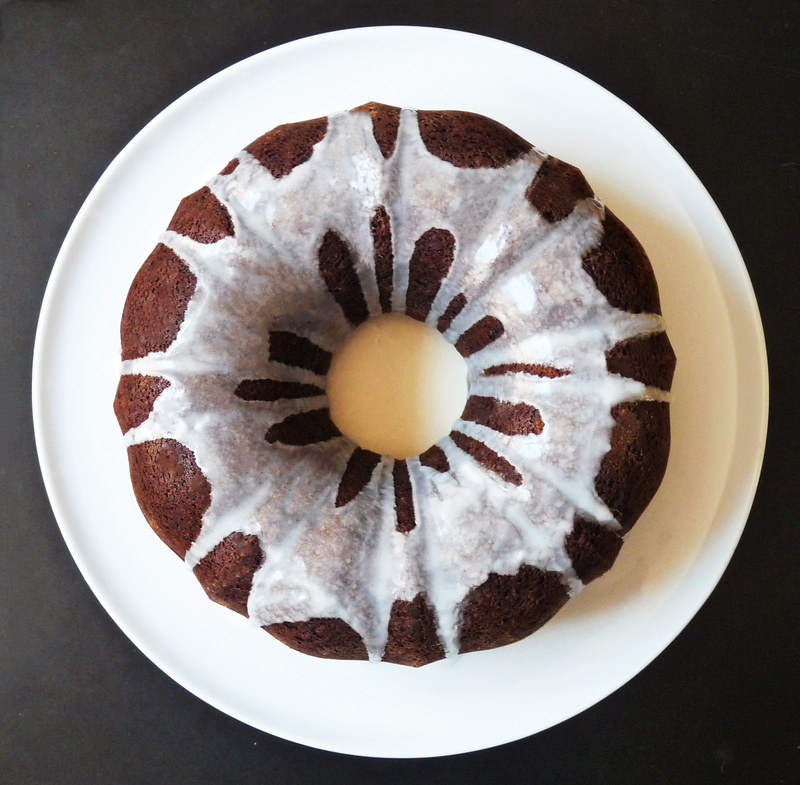 In a medium bowl, whisk all the glaze ingredients together until smooth. Good Sunday morning, baking gods and goddesses! Today’s recipe combines two personal favorites – French toast and the flavors of a vanilla chai latte – into one AMAZING breakfast dish. I wish I could claim this genius idea was my own, but credit goes to fellow blogger Savory Simple. Check out her blog for all things foodie-beautiful and delicious! In a small bowl, whisk together the cinnamon, cardamom, allspice, ginger and cloves. Set aside. For the french toast, whisk together the eggs, milk, sugar, vanilla extract and 1 tablespoon plus 1 teaspoon of the chai spice mixture in a medium bowl. Grease a medium-sized (8×8″ or similar) casserole or baking dish with the softened butter and layer the cubed bread inside, gently pressing it down. Briefly re-whisk the liquid ingredients and pour them evenly over the bread, taking care to cover all of the exposed bread. Cover with plastic wrap and refrigerate for a minimum of 30 minutes or as long as overnight to allow the mixture to absorb into the bread. When ready to bake, preheat the oven to 350° Fahrenheit (175° Celsius). In a small bowl, combine the topping ingredients until crumbly. Uncover the baking dish and gently press the bread down evenly until the liquid begins seeping up. Spread the topping evenly over the bread. Bake for 45 minutes until the top is golden and crunchy. Allow to cool for several minutes, then slice and serve. 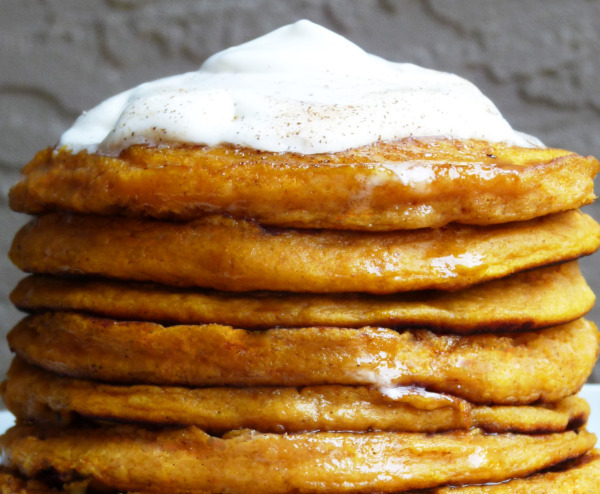 These Pumpkin-Ginger Pancakes are DELICIOUS, a perfect autumn breakfast for both children and adults. I’ve made them on several occasions – sometimes serving with toasted pecans, sometimes with butter and syrup – but am most fond of these wee flapjacks with a large dollop of lightly sweetened, freshly whipped cream. Enjoy! In the bowl of an electric mixer detached from the mixer unit, whisk cream and caster sugar until sugar dissolves, about 2 to 3 minutes. Transfer bowl to mixer unit, add vanilla extract, and whip on medium-high speed until soft peaks form. Cover and refrigerate. In a large mixing bowl, stir together flour, brown sugar, baking powder, baking soda, cinnamon, ginger, nutmeg and salt. In another bowl, mix egg, milk, pumpkin, yogurt and butter until well blended. Stir egg mixture into flour mixture just until evenly moistened. Place a non-stick griddle or 12-inch non-stick frying pan over medium heat (350 degrees). When hot, coat lightly with butter and adjust heat to maintain temperature. Spoon batter in 1/4-cup portions onto griddle and gently spread into 3-inch rounds. 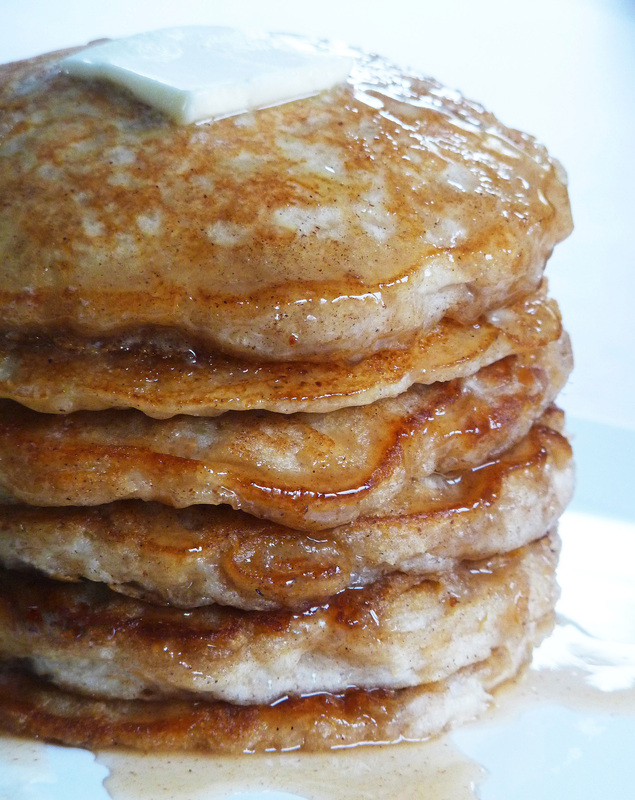 Cook until pancakes are browned on the bottom and edges begin to appear dry, about 2 to 3 minutes. Turn with a wide spatula and brown other sides, 2 to 3 minutes longer. 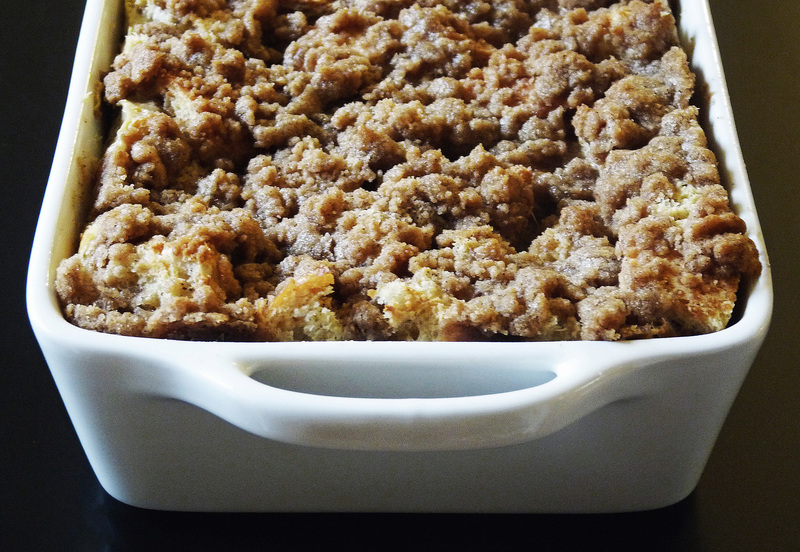 Serve warm with chilled fresh whipped cream and a dusting of cinnamon sugar. Next post: Southwestern Spiced Sweet Potato Fries!